Originally I was going to make these vanilla cupcakes as rainbow cupcakes, but the batter was way too thick, so these are just regular vanilla cupcakes. I’ll be adding rainbow cupcakes at a later date. But these vanilla cupcakes were actually super yummy. As per vanilla cupcakes go, these probably have the most flavor out of any that I have ever tried. The only downfall was they were a little dry, so if you make these you might wanna add like 1 or 2 tablespoons of vegetable oil to the butter egg and sugar mixture before adding the flour and cream. Also, this recipe only makes about 12 cupcakes, so I doubled it to get 24 cupcakes out of this recipe. Other then that this recipe was really yummy. As per the frosting goes, it says it’s sweetened whipped cream frosting, but really it’s just whipped cream. I thought when I tried it that maybe the gelatin would add an extra thickness to the whipped cream to make it more frosting like, but it’s basically just normal whipped cream. It’s super yummy, don’t get me wrong, but just know it’s not going to be think like a frosting. Allow butter, egg, and egg yolks to stand at room temperature for 30 minutes. Meanwhile, line twelve 2 1/2-inch muffin cups or forty-eight 1 3/4-inch muffin cups with paper bake cups. If using vanilla bean, use a small sharp knife to scrape the seeds from the vanilla bean; set seeds aside. In a small bowl stir together flour, baking powder, and salt. Preheat oven to 350 degrees. In a large mixing bowl beat butter with an electric mixer on medium to high speed for 30 seconds. Add sugar, beating on medium to high speed for 1 minute. Scrape sides of bowl. Add egg, egg yolks, vanilla bean seeds (or the 1 teaspoon vanilla extract), and the 1/2 teaspoon vanilla extract; beat until combined. Alternately add flour mixture and whipping cream to butter mixture, beating on low speed after each addition just until combined (batter will be thick). Spoon batter into prepared muffin cups, filling each about three-fourths full. Use the back of spoon to smooth out batter in cups. Bake about 20 minutes for 2 1/2-inch cupcakes (about 15 minutes for 1 3/4-inch cupcakes) or until a wooden toothpick inserted in centers comes out clean. Cool cupcakes in muffin cups on wire racks for 5 minutes. Remove cupcakes from muffin cups. Cool completely on wire wracks. 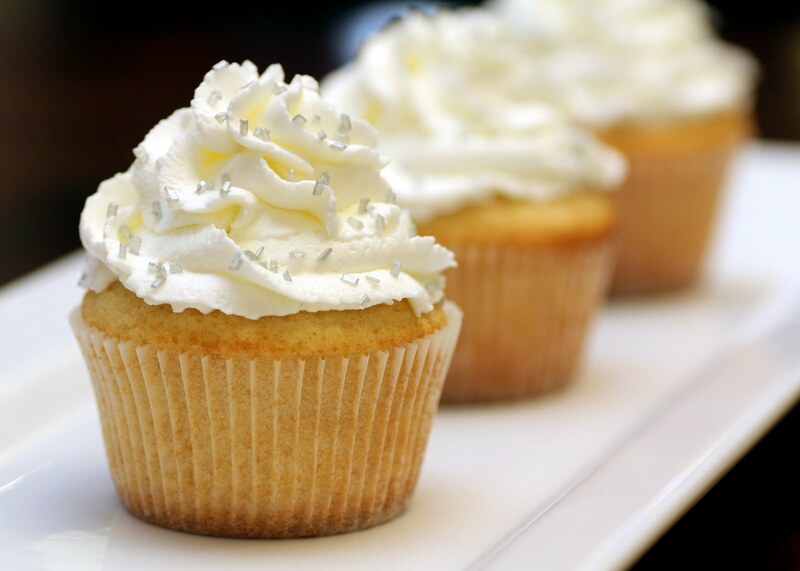 Frost with Sweetened Whipped Cream Frosting, or desired frosting. In a large saucepan bring about 1 inch water to boiling over high heat. Meanwhile, in a 1-cup heatproof glass measuring cup combine the cold water and gelatin. Let stand for 2 minutes. Place measuring cup in the saucepan of boiling water. Cook and stir about 1 minute or until the gelatin is completely dissolved. Remove measuring cup from water; set aside. Cool for 5 minutes. In a chilled large mixing bowl beat whipping cream and sugar with the chilled beaters of an electric mixer on medium speed while gradually drizzling the gelatin mixture into the cream mixture. Continue beating the cream mixture until stiff peaks form.